Piab's piSMART® vacuum technology is feeding into the food industry's transition to 4.0. Taby, Sweden – Promising to feed the smooth transition towards increasingly intelligent and internet-connected systems in the food industry, Piab is introducing piSMART® versions of its most advanced vacuum equipment. Aimed primarily at boosting productivity and energy-efficiency, piSMART® systems will also offer new tools for guaranteeing that procedures always adhere to regulations and standards for food hygiene and food safety. With cleanliness being of vital importance in the food industry, new "big data" analysis tools for condition monitoring and predictive maintenance will be particularly welcome. Data for these tools will be fed from both strategically placed sensors in equipment and from the cloud, supporting both operator-controlled and automatically regulated processes. Auto tuning, simulations and real-time adjustments are some examples of new services that build on and are enabled by the advanced features already implemented by Piab in some of its vacuum products - Automatic Level Determination (ALD), Automatic Condition Monitoring (ACM), Intelligent Blow-Off (IBO), Self-Adhesion Control (SAC) and Energy Saving (ES). Starting with piCOMPACT®, Piab's flagship all-in-one vacuum ejector series, the addition of piSMART® will eventually also extend to other high-end ejectors as well as conveyors and lifting systems. The piCOMPACT® is already available with generic and fieldbus-independent input/output technology IO-Link, enabling a high degree of on-board intelligence. 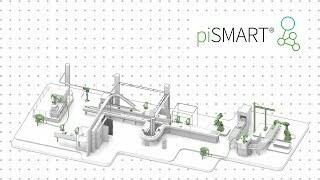 Piab's adoption of IO-Link is an important key to the interoperability required in Industry 4.0 processing units, and the addition of piSMART® shows that Piab is now ready for the higher level of process control supported by cloud-based "big data" that this fourth industrial revolution will realize.